In an ideal world, where you knew your yard like the back of your hand, and every plant you ever wanted was readily available, and the weather didn’t swing merrily between a wetter than average year (2010 with over 26″ of rain) and the worst drought on record with just under 6″ of rain, planning would be a bit easier (best solution — plan for the extremes i.e. 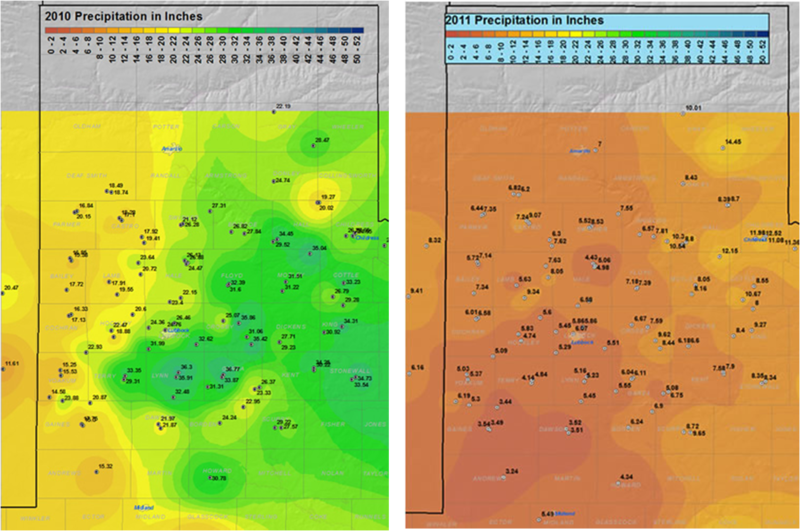 driest/hottest/coldest and allow the biomass to build up during the more moderate years). 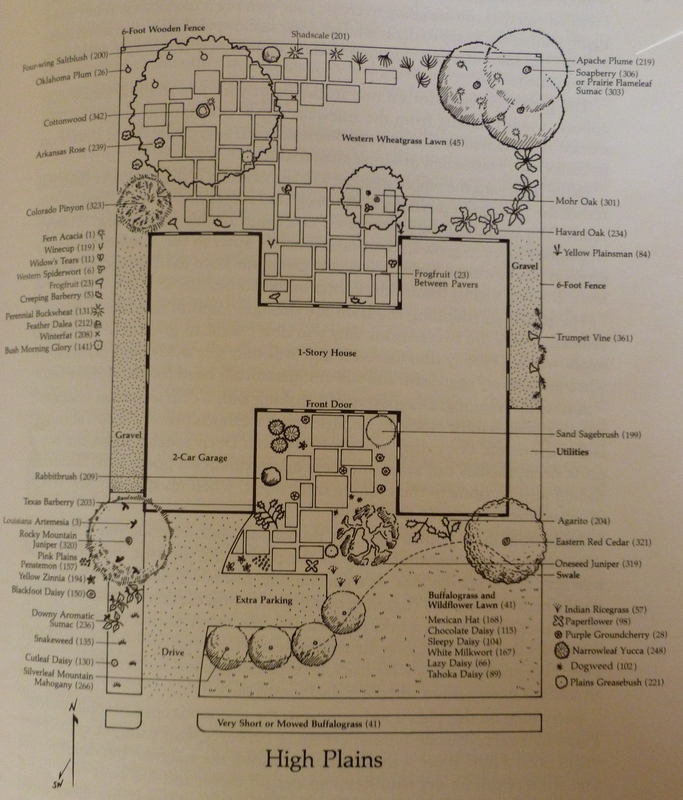 High Plains plan from the indispensable “Native Texas Plants: Landscaping Region By Region” by Sally and Andy Wasowski. I used this plan, with sketches of the sunny and shade areas to zone where to put my seed mixes, which for the East side of the lawn were a mix of Native Trail Mix; Texas-Oklahoma Native Roadside Mix (which is almost the same as the Native Trail Mix, but without the grasses); Shade Friendly Wildflowers; Shade Friendly Grass Mix; and the Western Wildflower Mix which used to be called the Llano Estacado Mix as it is inspired by this area. This was a pretty good approach, because you can plant in keeping with broad microhabitat requirements (shade/sun), and then allow selection to take its course and weed out the species that are least suited to your yard’s conditions on a smaller scale. It of course doesn’t allow for planning on a species by species basis — but I like the diverse meadow/prairie look — it seems more like a habitat than a yard. 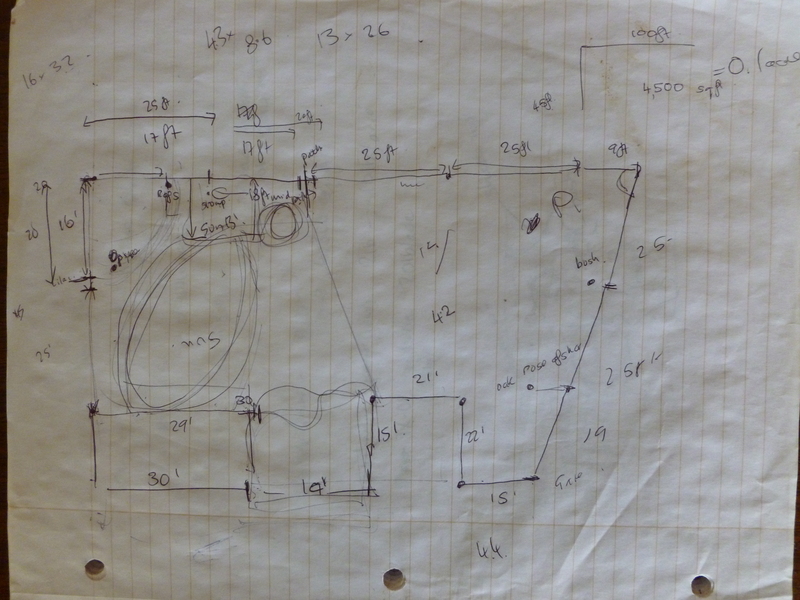 Having mapped your yard also enables you to work out the area of each zone (if you can do the horrible math — I have problems working with the non-metric system and tend to resort to online calculators to get my square footage), and this helps plan how much seed to buy, as you are usually told in lbs or oz per square foot. I’m a bit of a pessimist when it comes to germination and survival rates up here, so tend to over-seed. Time to plan! 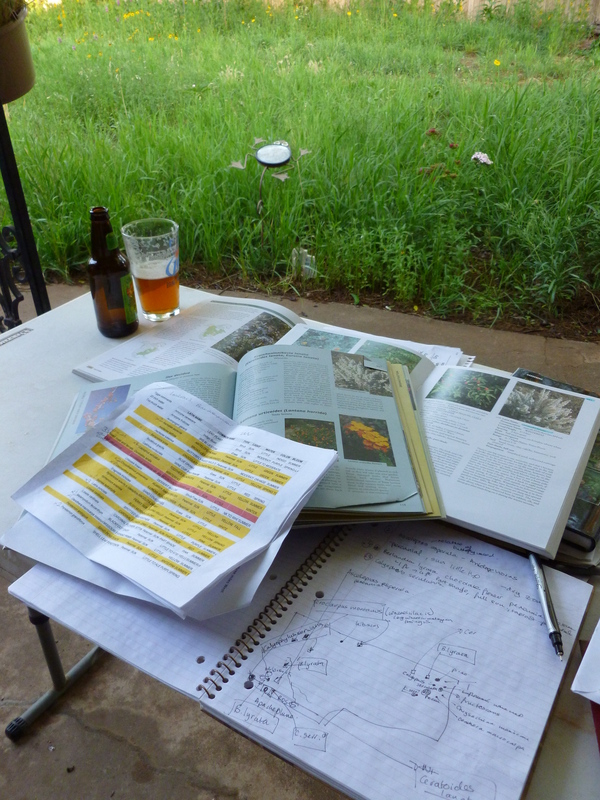 Yard map, species list, books, a view of the yard and beer are the essential components of this stage. Of course, when it comes to actually planting them out, I don’t always follow my plan; I like to have a little bit of wiggle room for last minute adjustments, but at least having some sort of plan means you aren’t wandering around the yard with armloads of plants trying to work out where to put things. Generally I mark existing plants in solid shapes on the map and possible locations for newbies with open shapes and a label (ingenious I know). I do know my yard quite well now, and generally the challenging part is to deal with the full sun “zones of death”, which I’m trying to slowly fill up with xeric perennials. Much of the East side is quite shady because of a huge pecan tree. This entry was posted in Uncategorized and tagged planning, seed mixes, where to buy. Bookmark the permalink.